1. To provide "dwelling accommodations and social and recreational facilities to persons and families of low and moderate income." 2. "Act as a real estate manager of projects developed by it or by Ibero-American Action League, Inc."
3. "To provide quality affordable housing and opportunities for economic advancement for Hispanic and other minority persons and families." 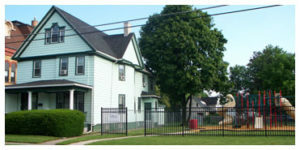 At its inception, the primary activity of IADC was the development and management of properties occupied by its affiliated company, the Ibero-American Action League, Inc. Over the years, IADC has expanded its focus on property management to include the development of affordable housing and commercial facilities for the Latino community within its service area. In connection with these expanded goals, IADC in August, 1992 launched an affordable housing initiative and was designated by HUD as a "Community Housing Development Organization" ("CHDO") in the City of Rochester under the federal Home Investment Partnership Program ("HOME"). This has made IADC eligible to receive allocations of HOME funds for affordable housing development. To date, and acting as construction manager and real estate agents IADC has developed and sold hundreds of vacant houses to low and moderate income homebuyers. IADC has also initiated activities to develop commercial space to house services for the Latino Community and others. Led by Eugenio Marlin, our staff has expertise in real estate sales, and property development and management; including all of the necessary technical and financial "know-how" to bring projects from the drawing board to the bank, and from the bank to the community. Over the last 30+ years, our portfolio has grown to include renovations that created jobs and anchored services and education to the community, new commercial structures that returned and reinvigorated inner city businesses, and housing developments that raised and rescued entire neighborhoods. We're celebrating the past 25 years and ushering in an uncommon future for upcoming generations.